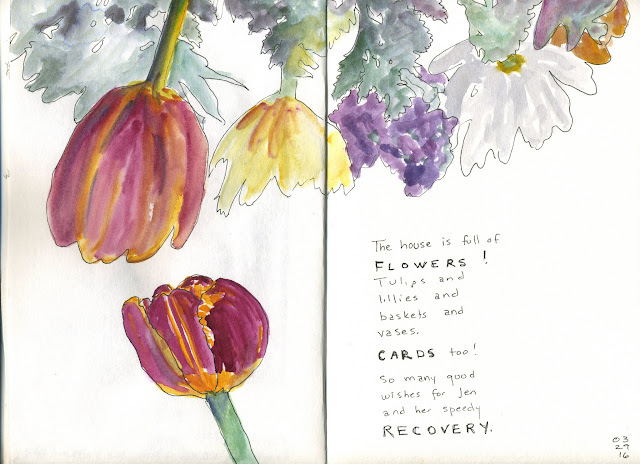 One day in March I sat down to sketch some of the flowers in our house. I put the flowers in the middle of the table, grabbed a pen and looked down... a wonderful, interesting shadow had been cast through the flowers by the overhead light. It produced a fascinating shape of grouped upside-down flowers. So I did a contour drawing of that! Then I did one tulip right-side up, journaled a bit, and then did close observation of colors and values as I painted. When I turned the finished page upside down, the conglomeration of flowers looked very interesting to me--quite like the bouquet and not really like anything I think I could have produced if I had been working right-side up the whole time. A good reminder of how tricking the "it should look like this" part of the brain can bring good results!